Our German engineers have developed a customized top-tier synthetic motor oil with an effective formulation for optimal engine protection in urban traffic when 75% of engine wear occurs because of frequent start-stops, rapid acceleration and short-haul trips. This formulation provides an extra layer of protection for turbocharged and supercharged gasoline and diesel engines equipped with DPF and TWC systems and automatic start-stop systems. Our German engineers have developed an effective motor oil with a top-tier synthetic formulation for optimal engine protection for Hybrid vehicles and vehicles equipped with automatic Start-stop systems. This motor oil is specially optimized for urban traffic when most engine wear occurs because of frequent start-stops, rapid acceleration and short-haul trips. This formulation provides an extra layer of protection for turbocharged and supercharged gasoline and diesel engines equipped with DPF and TWC. BIZOL motor oils are continuously improved to reduce maintenance costs, repair costs and to increase the lifetime of your car according to strict requirements of the German automotive industry. BIZOL Green Oil 5W-30 is a highly modern low-friction motor oil for year-round use. It is specially designed for vehicles used permanently in city traffic. 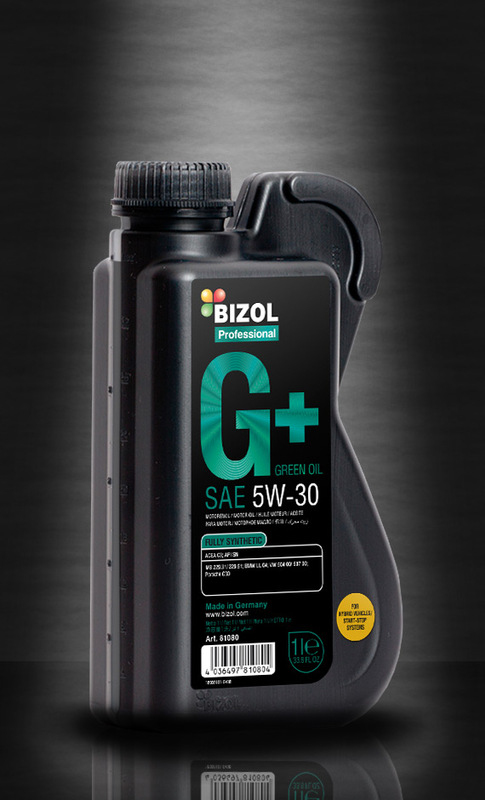 The specially developed additives provide BIZOL Green Oil 5W-30 with its characteristic green colour providing high stability for the engine throughout its entire life cycle. Excellent wear resistance and perfect lubrication characteristics are enhanced under any operating conditions, especially in city traffic. 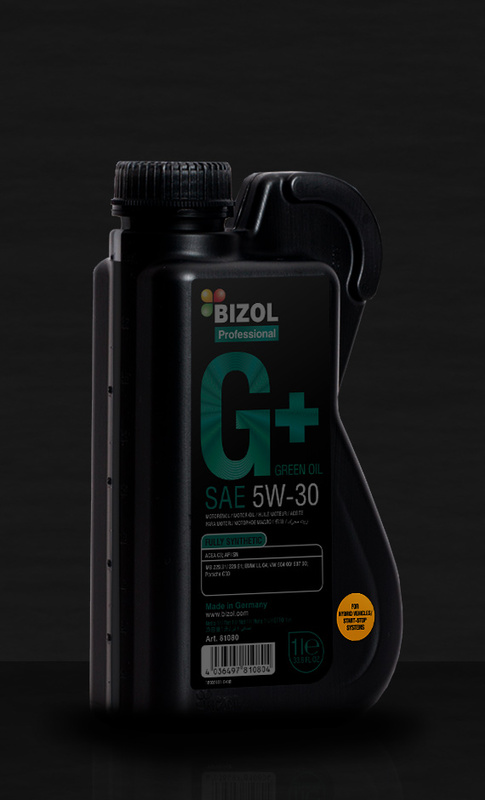 BIZOL Green Oil 5W-40 is a unique motor oil of the latest generation based on HC-Synthesis. Through the application of unique technologies German engineers were able to develop an innovative product for the latest types of gasoline,diesel and turbo diesel engines. It perfectly protects against wear, especially under city traffic conditions. Because of its unique technology BIZOL Green Oil 5W-40 provides the highest oil stability for the whole life cycle of the engine. Its good wear protection and lubrication properties remain unchanged even under extreme operating conditions. The green color of this product is an indicator for its incomparable technology and unique additives. BIZOL Green Oil 10W-40 guarantees the highest oil stability for the whole life cycle of the engine. It is especially suitable for engines working under heavy city traffic conditions. Its excellent corrosion protection and lubrication properties remain unchanged even under extreme operating conditions. The green colour of this product is an indicator of its incomparable technology and unique additives. This innovative motor oil has a very high anti-wear protection quality. It was developed by German engineers as a universal motor oil for both old and new diesel and gasoline engines. BIZOL Allround 5W-30 C2 / C3 has been expertly engineered to help prolong the life and maintain the efficiency of the emission systems in both diesel and gasoline engines. It has been developed to help deliver outstanding performance and protection in conjunction with improved fuel economy. BIZOL Allround 5W-30 C2 / C3 contains premium mid-SAPS additive technology for ACEA C2/C3 requirements. Not suitable for VW R5 and V10 engines manufactured before 2007. BIZOL Allround 5W-30 is a modern low-friction motor oil of the highest quality suitable for year-round use. A combination of unconventional base oils made on the basis of synthesis technology with the additive package of the latest generation (mid SAPS technology) guarantees a motor oil with low viscosity and high stability against shearing. It reliably prevents deposits, reduces engine friction, and protects against wear. As a result fuel economy and time extended service life of the engine are preserved. This product is recommended for all gasoline and diesel engines including turbochargers and catalytic converters. Especially recommended for gasoline engines with TWC and for diesel engines with DPF. BIZOL Allround 5W-40 is a fully synthetic, high-performance, low-friction motor oil designed for year-round use in modern engines. It reduces oil and fuel consumption and grants optimum lubrication even under extreme conditions. It ensures an immediate lubricating effect at cold start because of its constant wide-range viscosity, which resists even extreme temperature fluctuations. The unique compound of BIZOL Allround 5W-40 ensures optimal engine performance and oil pressure at all speed ranges. The improved wear protection prolongs the service life of the engine. 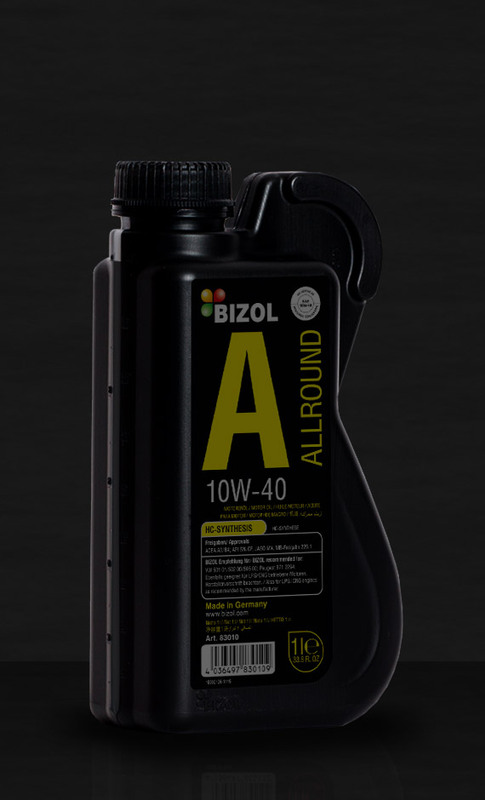 BIZOL Allround 15W-40 is a modern high-performance mineral motor oil for all year-round use in petrol and diesel engines, including engines with turbocharger and catalytic converter. Because of the combination of advanced additives of the latest generation it ensures excellent protection against oxidation, wear, improved protection against foaming, and has anti-corrosive and purifying properties. 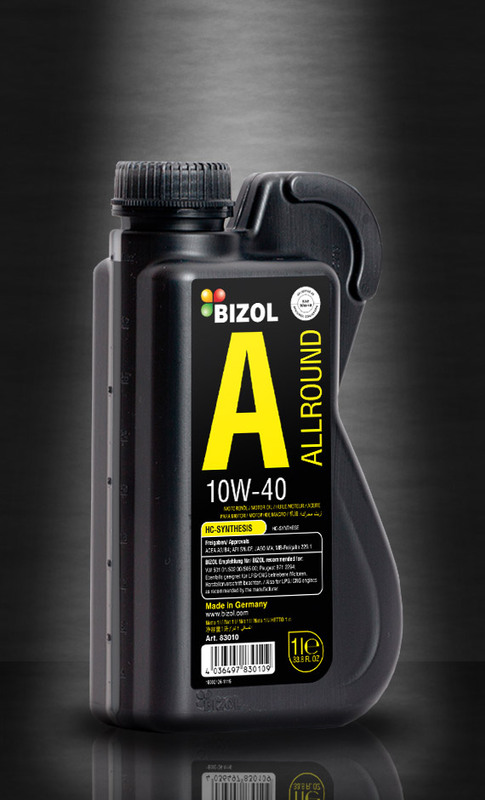 BIZOL Allround 20W-50 is a high-performance multigrade motor oil for gasoline and diesel engines. It is universal in its application, among others also suitable for a commercial vehicle fleet. Designed specially for high-load engines. It meets the requirements of most leading vehicle and engine manufacturers. BIZOL Technology 5W-20 ECO is a modern low viscosity motor oil formulated by using high quality HC Synthetic base oils and state of the art additive technology. It is especially developed for the requirements of Ford ECO BOOST gasoline engines and ensures excellent lubrication safety as well as fuel savings. Bizol Technology 0W-20 is a synthetic motor oil effective especially for downsized modern engines which need to be very fuel efficient. It is suitable for engines with exhaust-gas-turbocharger . The combination of base oils and additives result in a motor oil which provides an effective wear protection at high and low external temperatures. BIZOL Technology 0W-20 509 is a fully synthetic, high performance motor oil meeting the latest standards for VW and Audi engines. This motor oil is effective in optimizing fuel consumption. It has excellent wear protection properties increasing the longevity of the engine. BIZOL Technology 0W-30 is a highly modern fully synthetic, low-friction motor oil for year-round use. The combination of unique synthetic base oils with an advanced additive technology results in an motor oil with low viscosity and high stability. It reliably prevents deposits, reduces friction losses in the engine, and protects from wear. BIZOL Technology 0W-30 is recommended for use in petrol and diesel engines including turbochargers and catalytic converters. 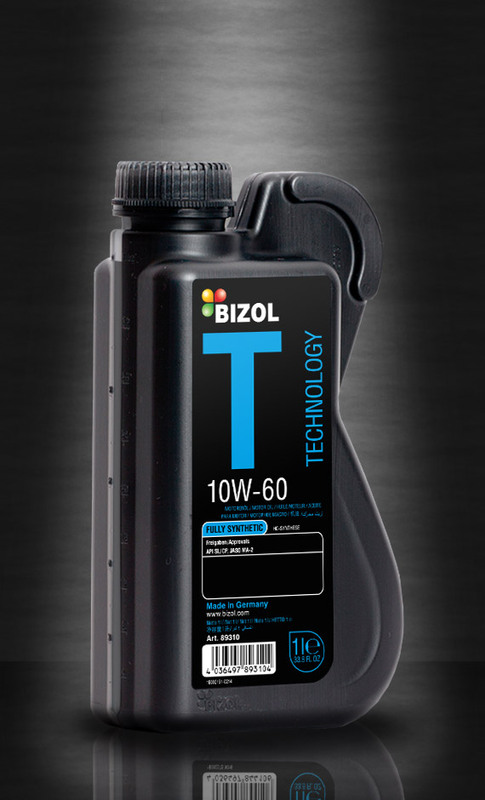 BIZOL Technology 5W-20 is a modern motor oil based on synthesis technology. The combination of base oils and special additive components results in a motor oil with reduced exhaust emissions and fuel saving properties. BIZOL Technology 5W-20 provides a fast lubrication of the engine that significantly reduces wear in the cold start period. 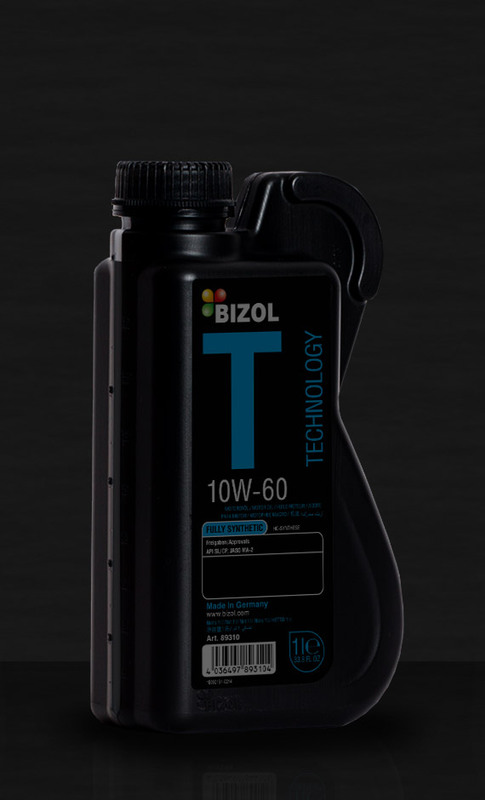 BIZOL Technology 5W-30 507 is a modern high-performance, long-life motor oil with reduced ash content. This oil is universally formulated in compliance with the requirements of VW motors. It is backward compatible to the previous generations of motors under consideration of recommended oil change intervals. It is suitable for VW vehicles with and without extended oil change intervals, as well as for FSI engines and other types of diesel engines with diesel particulate filter (DPF). Can be applied in diesel engines, such as V10 R5-TDI with pump injector with and without DPF built since 06/2006. BIZOL Technology 5W-30 C2 is a modern HC motor oil for all season use in passenger cars gasoline and diesel engines. Specially developed for vehicles of Japanese and Korean car manufacturers. Meets the latest requirements for piston clearness and engine sludge protection. Provides improved durability of catalyst and turbocharger. BIZOL Technology 5W-40 C3 is a high performance motor oil based on HC Synthetic technology for a wide range of applications. Its balanced formulation allows for smooth engine running and it also fulfills the high requirements of VW 505 01 (pump nozzle specifications) and those of other manufacturers. BIZOL Technology 5W-40 C3 offers maximum protection for diesel particle filters and as well for catalytic converters. BIZOL Technology 5W-40 is one of the most modern low viscosity year-round motor oils that can be used in diesel and gasoline engines with or without exhaust-gas turbochargers and charge air cooler. Because of its state-of-the art HC-Technology and the superior additive package used, this oil provides reduced fuel consumption, remarkable engine performance with extended service intervals. This oil ensures best wear protection and a smooth cold start. BIZOL Protect 5W-30 is a high performance, fuel economy gasoline engine oil based on special selected synthetic base oils with a high viscosity index and a well balanced choice of advanced additives. It is especially formulated for the lubrication of modern gasoline engines of passenger vehicles, vans and SUVs. The effective formulation of BIZOL Protect 5W-30 provides a superior lubrication for all major engine components resulting in a longer engine life. It provides improved protection for the latest emission control systems by meeting the specifications ILSAC GF-5 and GM Dexos 1 Gen. 2. BIZOL Protect 0W-40 is a highly modern fully synthetic, low-friction motor oil for year-round use. The combination of unique synthetic base oils with advanced additive technology results in an motor oil with low viscosity and high stability. It reliably prevents deposits, reduces friction losses in the engine, and protects from wear. BIZOL Protect 0W-40 is recommended for use in gasoline and diesel engines including those with turbochargers and catalytic converters. BIZOL Protect 5W-40 is a modern high-performance, low-friction motor oil designed for diesel and gasoline engines with or without exhaust-gas turbochargers and charge-air coolers. A modern additive technology in combination with unique base oils provides this product with its outstanding characteristics with respect to reduced friction and wear protection. Thus, it significantly helps to extend the oil change intervals. BIZOL Protect 10W-40 is a modern high-performance, low-friction motor oil designed for diesel engines with or without exhaust-gas turbo-chargers and charge-air coolers. Modern technology in combination with unique base oils provides this product with its outstanding characteristics as reduced friction and wear protection and helps prolonging the intervals between oil changes. BIZOL Protect 10W-40 UNI is a universal all year-round motor oil for all types of modern turbocharged and non-turbocharged diesel and gasoline engines under all operating conditions, even when extended oil change intervals are required. The latest additive technology in combination with high-quality base oils ensure the unique properties of this oil. This product is ideally suitable for mixed fleets. BIZOL Protect 15W-40 is a motor oil that meets the latest requirements of the automotive industry. Reliable base oils in combination with the latest additive technology have produced a motor oil that withstands the stress of a modern diesel engine under all operating conditions. The product neutralizes negative influences of fuel, reduces friction and wear, and prevents sludge formation.